CBS has officially picked up the currently untitled Rob Schneider sitcom for a mid season replacement. Rob portrays a seemingly confirmed bachelor who marries into a tight-knit Mexican-American family. The series co-stars Cheech Marin, Lupe Ontiveros (from "As Good as It Gets") and Claudia Bassols. Schneider will write and executive-produce, along with Lew Morton, of "Futurama" and "Big Lake." Jamie Widdoes is directing. The series is produced by CBS Television Studios, in association with The Tannenbaum Company, which co-produces "Two and a Half Men." Eric and Kim Tannenbaum will serve as non-writing executive producers. This will mark Schneider's first regular TV gig since the comedy "Men Behaving Badly," which ran from 1996 to 1997. Another video from the General Mills Fiber One Brownies campaign. GOLDEN VALLEY, Minn. - Now in their 60s and 70s, Cheech and Chong need an extra ingredient in their “magic brownies” – fiber. General Mills is bringing back the iconic stoners, played by Cheech Marin and Tommy Chong, for a promotional campaign for Fiber One 90 Calories brownie snacks. The duo stars in a fictional movie trailer for Cheech and Chong’s Magic Brownie Adventure. Explaining the idea on its company blog, General Mills said the idea was born when somebody called them “magic brownies” in a marketing meeting, and the concept came to life. The trailer, posted on YouTube, shows Cheech and Chong on a mission to deliver a van of brownies to a Burning Man-like festival called Flaming Pole. Along the way, they’re reminded that "now that you're getting older, you need a new kind of magic from your brownie". 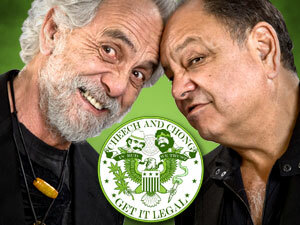 The Cheech and Chong: Get It Legal tour is coming to the Beau Rivage Theatre in Biloxi, Mississippi March 10th. Tickets go on sale Monday at 8AM local time via the ticketmaster link above. Lots of celebs came out Thursday night to celebrate the release of Alice Cooper's new album, Welcome 2 My Nightmare. The event took place at Hollywood's Whisky A Go-Go. Flanked by guest guitarists Steve Hunter and Orianthi, Copper started adding rock classics to his hit-laden set -- the Rolling Stones' "Brown Sugar," the Animals' "We Gotta Get Out of This Place" -- before bringing out several other guests. Ke$ha, who is featured on Cooper's new album, joined him for "School's Out," which included a bit from Pink Floyd's "Another Brick in the Wall," after bouncing around in the upstairs VIP section. Doors guitarist Robbie Krieger accompanied the band as they tore through "Break on Through" and Willie Dixon's "Back Door Man." Others there to see Alice perform were Tom Morello, his golf buddy, Cheech Marin, and Rob Zombie. June Fairchild, the beautiful cult scarlet from the 60s and 70s, makes a funny face to acting teacher Henry Jaglom in Jack Nicholson's directorial feature DRIVE, HE SAID (1971) and about seven years later does the same face, then expands on it with an elephant wail, during the famous scene as the "Ajax Lady" in Cheech and Chong's classic first (and best) film UP IN SMOKE (1978). Join the June Fairchild facebook fan page. Slightly Stoopid is pleased to announce their live debut at Grateful Dead/Furthur founding member Bob Weir’s TRI Studios on Tuesday, September 13, 2011. The band will perform two sets (acoustic & electric) and the performance will feature guests Karl Denson (Greyboy Allstars, Tiny Universe), Ian Neville (Dumpstaphunk, Funky Meters), and Don Carlos (Black Uhuru), with plenty of surprises in store. In between sets, fans can partake in the first-ever live Stoopid Q&A from TRI Studios, communicating with the band via onscreen Facebook and Twitter feeds. Tommy Chong will be hosting. TRI Studios is a state-of-the-art performance studio, broadcasting live HD video and audio streams via the Internet. The show will air live at www.tristudios.com at 6:00pm PDT, and will also be offered on re-play at 9:00pm PDT. Each streaming costs $10.00 for access. Tickets are on sale now for both showings and can be purchased by visiting www.tristudios.com or clicking the banner at www.SlightlyStoopid.com. The band members will be featured speakers at the SFMusicTech Summit on Monday, September 12, 2011, in support of this high profile, groundbreaking broadcast. Slightly Stoopid is currently on their Seedless Summer 2011 Tour making 25 stops in all, including some of the country’s best outdoor venues, such as Red Rocks Amphitheatre in Morrison, CO, The Greek Theatre in Berkeley, CA, and Cricket Amphitheater in their hometown of San Diego, CA. As The San Diego Union-Tribune recently reported, “Headlining Cricket for the third year in a row is a coup for the Ocean Beach-based group -- a feat unmatched by blink-182, Jason Mraz, Jewel, P.O.D. or any other nationally prominent San Diego act, past or present.” The complete list of Slightly Stoopid’s Seedless Summer 2011 Tour dates is included below. Formed in 1995 in San Diego, CA’s Ocean Beach by childhood friends Miles Doughty (guitar, bass, vocals) and Kyle McDonald (guitar, bass, vocals), Slightly Stoopid has become one of the most influential and progressive improvisational musical outfits on the tour circuit. As Amped Up Magazine points out, it’s for good reason. “Slightly Stoopid have perfected one of the rarest and most valuable skills a band can develop: the art of the stealth groove.” Always a festival favorite, Slightly Stoopid has performed at Coachella, Lollapalooza, Austin City Limits, Outside Lands, Milwaukee Summerfest, Wakarusa, and many others. With their two most recent albums both debuting on Billboard and iTunes charts, the band has sold over 750,000 albums and now releases all material on Doughty and McDonald’s own record label, Stoopid Records.